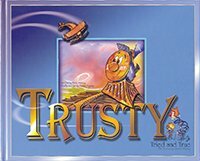 Trusty: Tried and True is part of the Children's Collection. Mom and Dad, written in the style of Dr. Seuss, this adorable adventure isbursting with colorful imagery to heighten a child’s imagination and stir creativity. Your children will learn much about selfishness, pride, and vanity through the characters of Brawny, Smarty, and Beauty. But most importantly, they will want to be more like Trusty, our hero, who is so eager to help. With self-sacrifice and courage, Trusty is willing to try. You can be sure you’ll soon know this story by heart, for it will undoubtedly become a family favorite—to be read over and over and over again! From Anonymous of Plainwell, Michigan on 2/3/2019 . The kids and I really enjoy the story of Trusty. I purchased this for my 5 yr. old and he now wants all the books in the Trusty series. I love how it rhymes! I highly recommend this for kids up to 7 years of age! My children all love this Trusty book. It keeps their attention (4,6,8). My 4 yr old is ALL boy & he requests this book to be read. My 8 yr old daughter enjoys reading to him. Im thankful for fun character building books for my children. From Lisa of Woodland Park, Colorado on 1/8/2018 . I was so excited to get our daughter her first Lamplighter Publishing book for Christmas. She is two and is very interested in trains right now. She likes the colors and the rhymes. While many children's books teach children to be kind, they don't explain why. I appreciated that Trusty helped because it was what God wanted him to do, and more than that, Trusty had prayed for the opportunity to be kind. From Anonymous of Rochester, Minnesota on 3/19/2015 . Great art work & story line! Bought it for a gift; wish the books had been around for my children. From Judith Hendrickson of Bellaire, Michigan on 7/29/2014 . I really enjoyed the rhyming nature of this book. The message will be remembered by children simply because the storyline is easy to recite. This book was for my grandson's birthday, and I'm pretty sure he'll be receiving the others in the "Trusty" collection for upcoming celebrations! Highly recommend.